Cowrie beach sits alongside The Nobbies, a popular tourist attraction on Phillip Island. The beach is home to lots of penguins and other sea birds, and is a beautifully rugged piece of coastline. Pictured below – The view from Cowrie beach looking towards The Nobbies. This image is available to purchase as a print here. Tech stuff – 5 seconds f/11 using an ND500 filter. 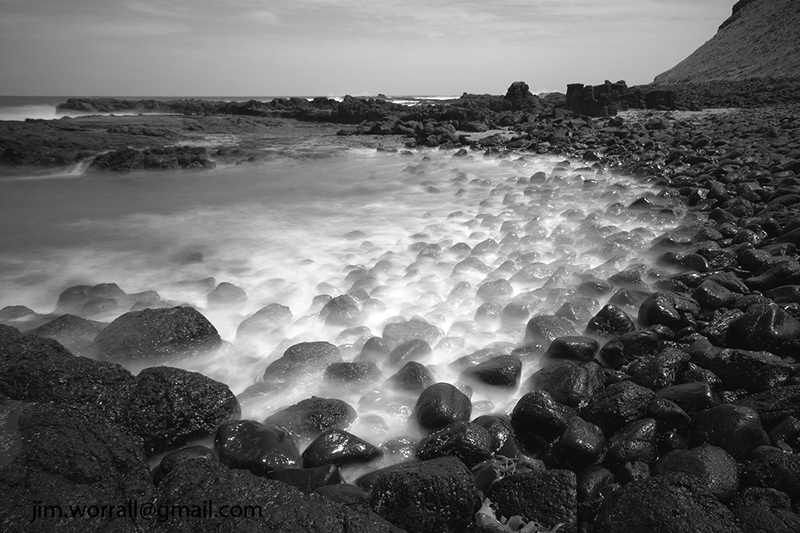 Pictured below – The rugged rocky coastline of Cowrie beach, looking away from The Nobbies. The image is available to purchase as a print here. Tech stuff – 2 seconds f/9 ISO100 using an ND500 filter. 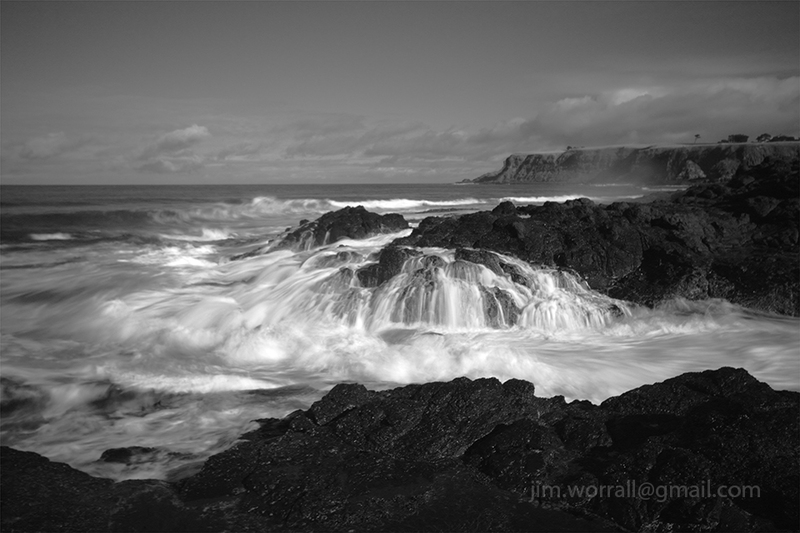 Some images from the wild n’woolly waters of Cape Schanck on the Mornington Peninsula. The image above is available to purchase as a print at Redbubble. The image above is available to buy as a print at Redbubble. Above – Behind the scenes. 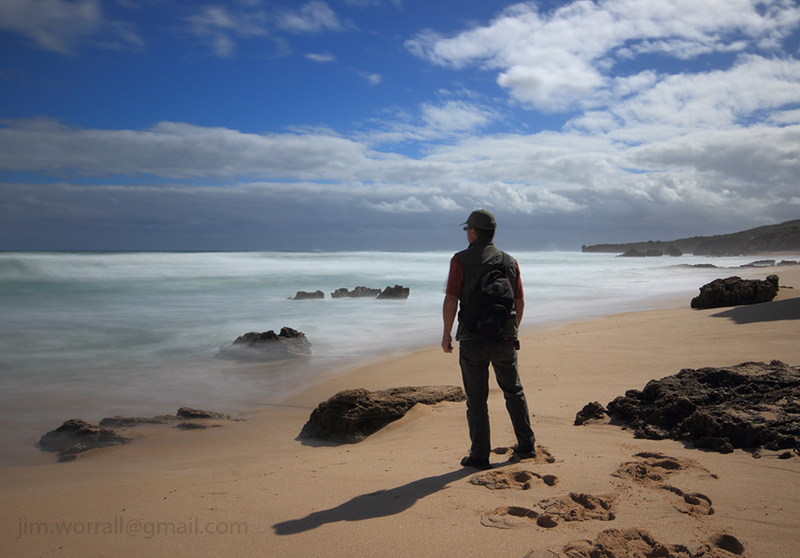 Following are some images from an excursion to the wild coastline at Bushrangers Bay on the Mornington Peninsula. I highly recommend the 3km hike from the carpark at Cape Schanck lighthouse to Bushrangers Bay. The scenic track follows the coastline along clifftops and through bush. 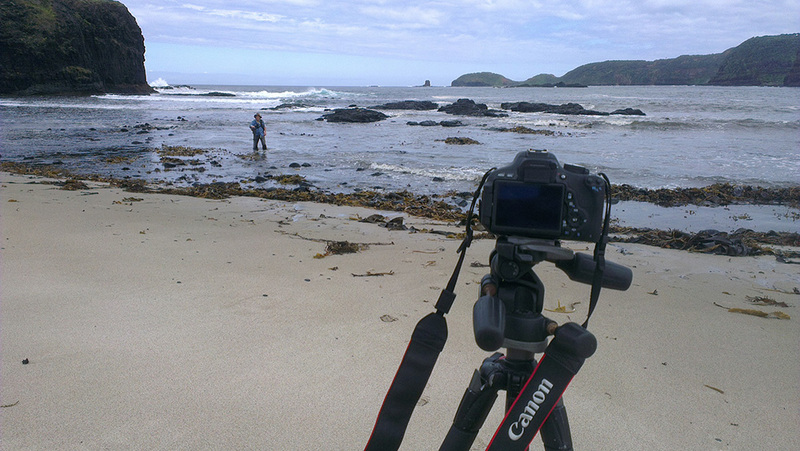 The best time to visit Bushrangers Bay is at low tide which allows access to the rugged rock formations. 2.5 secs f/8 using an ND400 filter. The image above is available to purchase as a print at Redbubble. 4 secs f/8 using an ND400 filter. The image above is available to buy as a print at Redbubble. 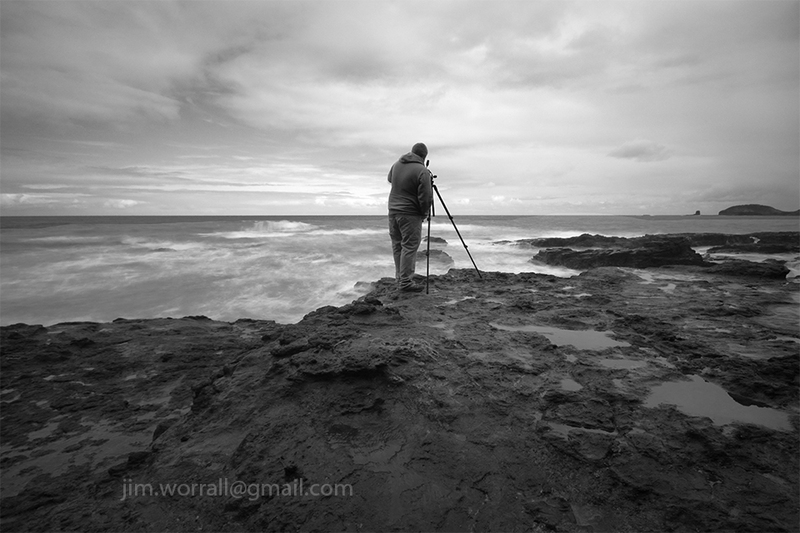 Pictured above, my friend Alan lining up his next shot at Bushrangers Bay. 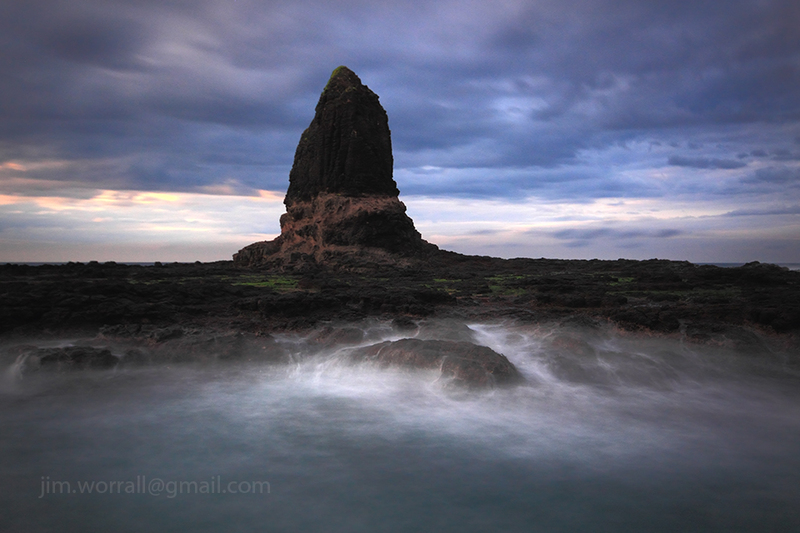 Pulpit Rock at Cape Schanck can be see on the horizon. This image is available to buy as a print in various forms at RedBubble. A collection of long exposure images from St Andrews Beach on the beautiful Mornington Peninsula. 10 seconds, f/13, iso100. The image above is available to purchase as a print at RedBubble. 30 secs, f/18, iso 100. The image above is available to purchase as a print at RedBubble. 15 seconds, f/14, iso100. The image above is available as a print at RedBubble. 48 seconds, f/8, iso200. The image above is available as a print at RedBubble. 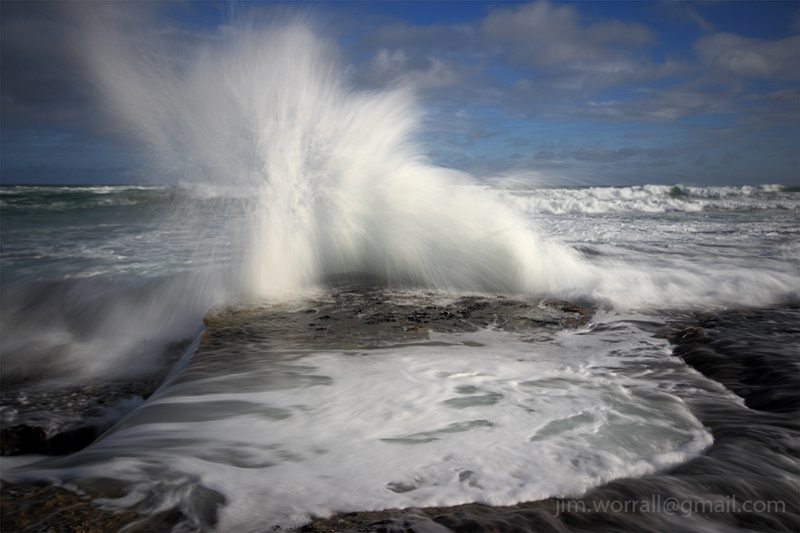 A wave explodes against rocks at Cowrie Beach on Phillip Island. 1/60th second at f/8. The image is available to buy as a print at Redbubble. Sunrise at Koonya beach in Blairgowrie on the Mornington Peninsula. 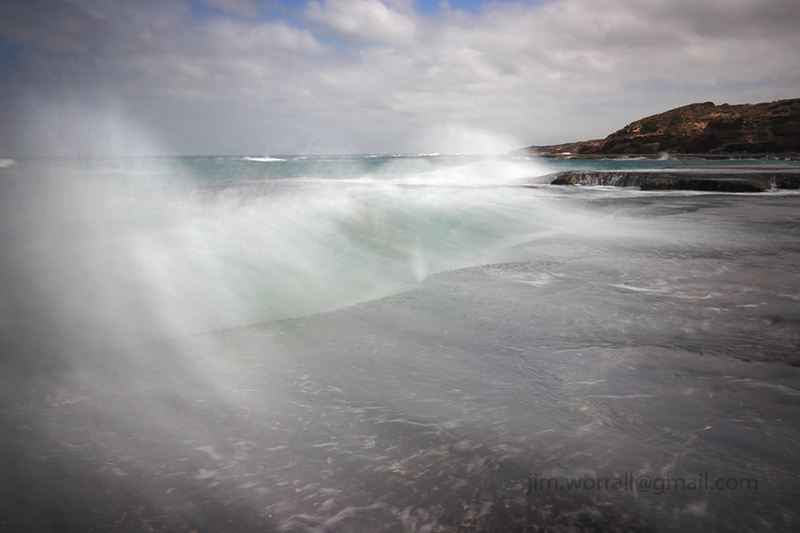 A series of long exposure images from The Blowhole Track at Flinders back beach on the beautiful Mornington Peninsula.. 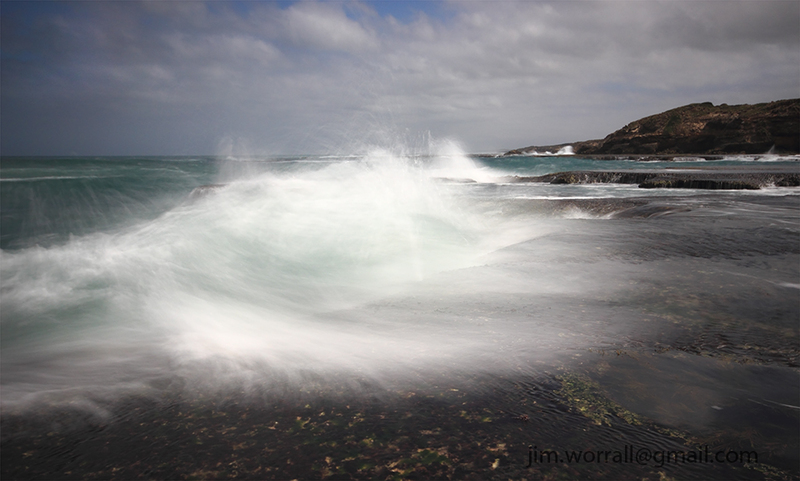 The Blowhole Track – Flinders. This was certainly one of the more memorable excursions that my photo group has undertaken, …and in a bad way. 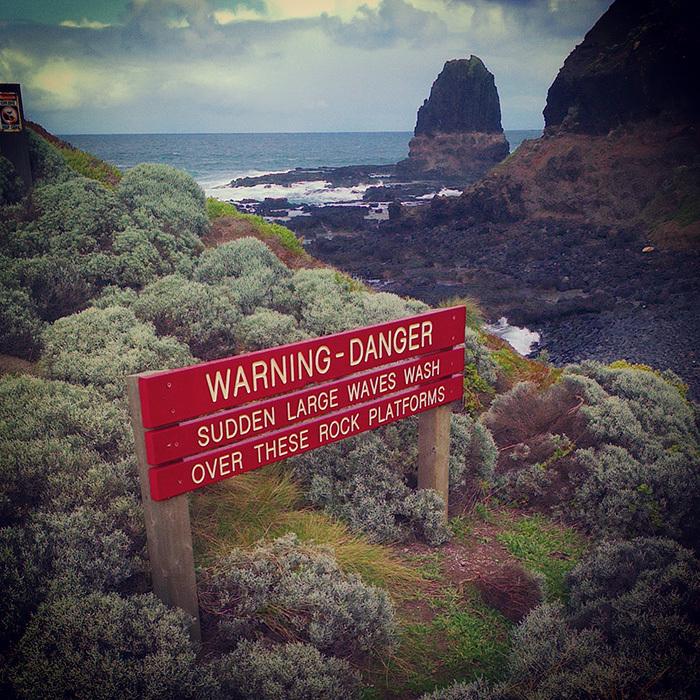 The rock selves at the end of Cape Schanck are hazardous at the best of times. On this particular visit two of our group members were caught off guard and knocked into water by an unexpectedly large wave. Thankfully both guys are OK and came away from the experience with minor injuries. It could have been a lot worse. Pictured below, the view from the rock platform at Pulpit Rock, Cape Schanck, looking across to Bushrangers Bay as the sun rises. 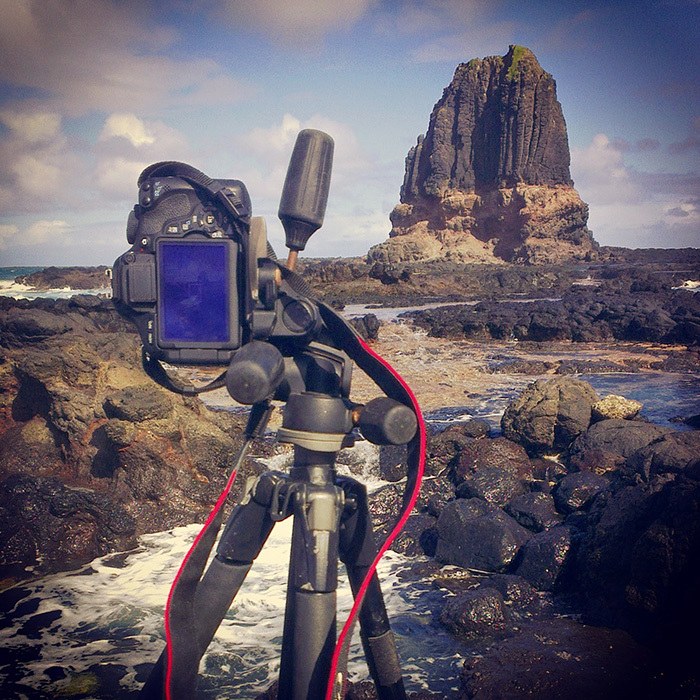 Pictured below, Pulpit Rock at the end of Cape Schanck. An 8 second selfie at Sierra Nevada Rocks at Point Nepean, Portsea. I’ll definitely be making a return trip to this awesome structure. A series of long exposure images from the SS Speke shipwreck at Kitty Miller Bay on Phillip Island. 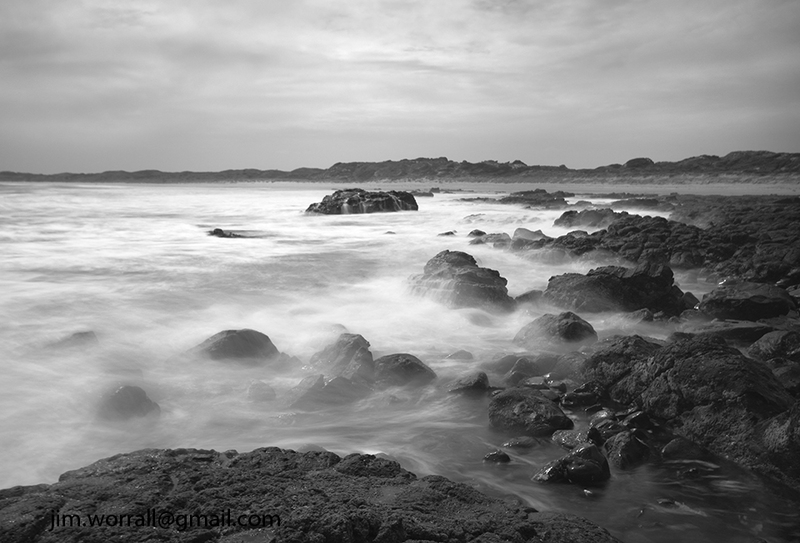 Below – A long exposure from Kitty Miller Bay, Phillip Island. Sunset at Grantville jetty on Western Port Bay. 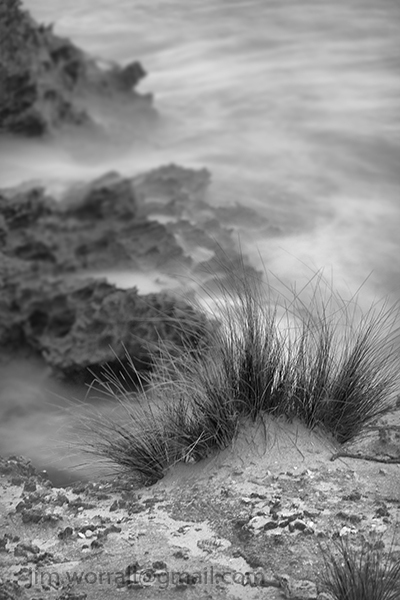 A couple of long exposure images from St Andrews beach on the Mornington Peninsula. 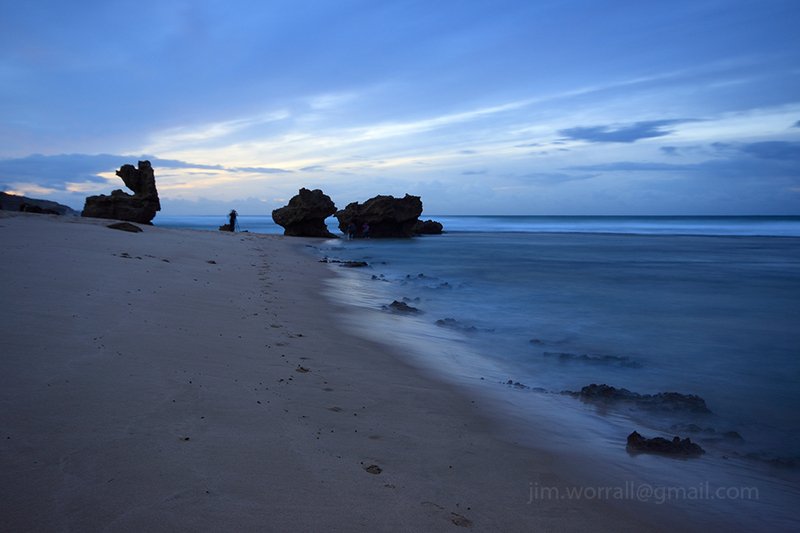 A couple of long exposure shots of rock formations at St Andrews Beach on the Mornington Peninsula. Here’s a bit of selfie fun from St Andrews Beach on a quiet afternoon. 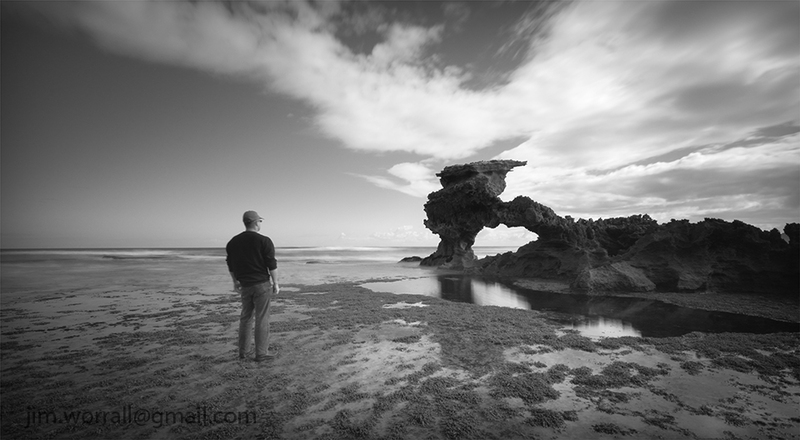 Below are some images from this weekend’s excursion to Fowlers beach in Blairgowrie. If you’d like to visit Fowlers beach the closest carpark is at the end of St Johns Wood Rd in Blairgowrie. Follow the track from the carpark area to the beach then turn right and follow the path for about two hundred metres. Where the wire fence ends walk down towards the edge of the cliff and you’ll see a “goat track” down the steep embankment to the beach. I would describe this as a medium difficulty access point, …not everyone will be comfortable with negotiating the sandy steep descent down to the beach. 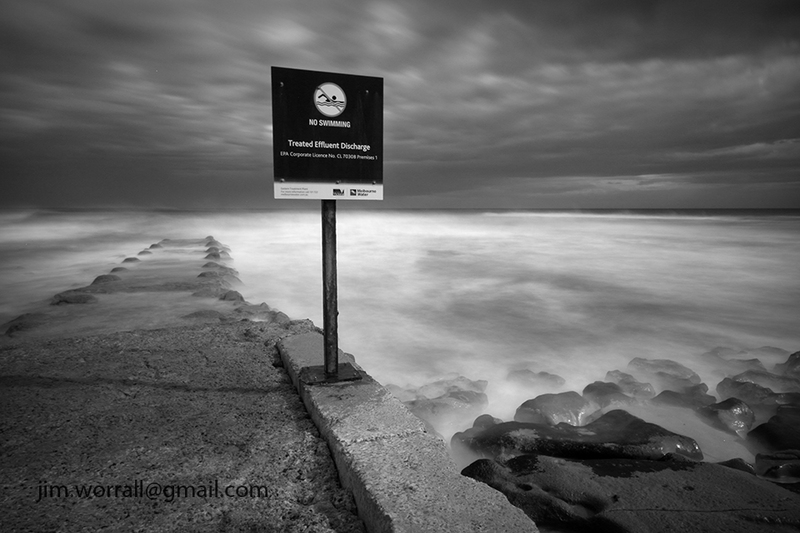 After the recent group excursion to Montforts beach I decided to revisit the place at high tide. The aim was to catch the three feature rock formations and also the “Bunny Rock” with a bit more water around their bases. If you’re interested in visiting these fine rock formations park your car at the end of Spraypoint Road in Blairgowrie and take the short walk to the beach. 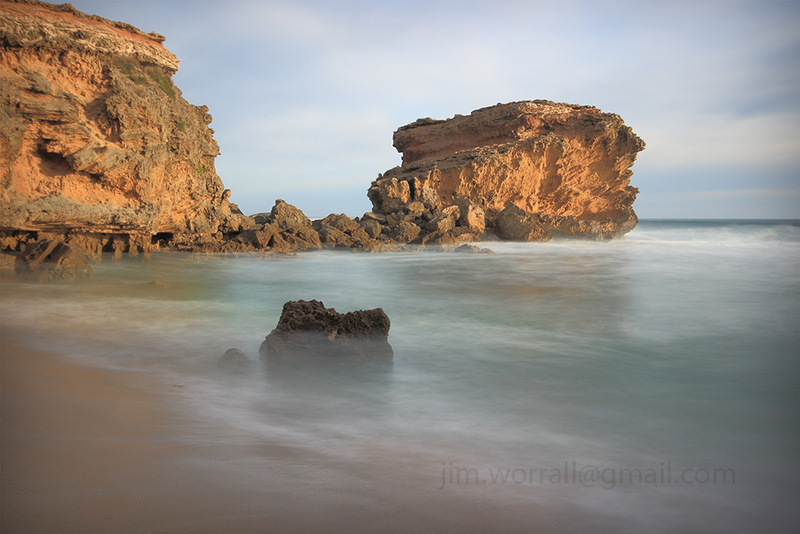 An image from Sorrento back beach on the Mornington Peninsula. 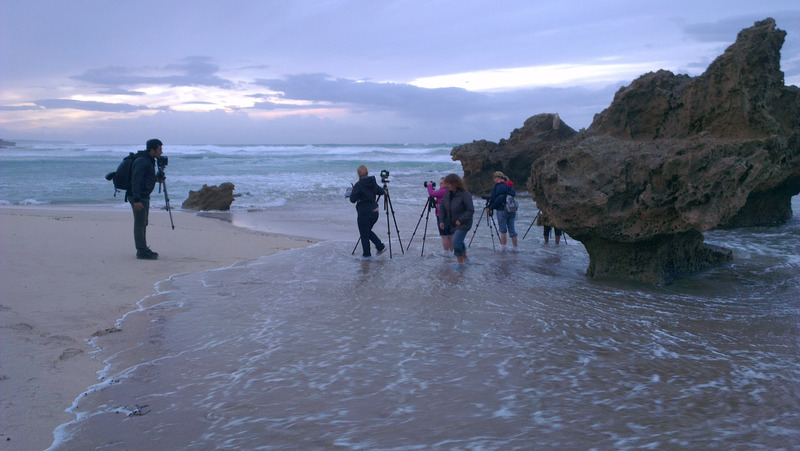 Some images from an early morning photography group excursion to Montforts beach in Blairgowrie on the Mornington Peninsula. Below – A Montfort Morn. Below – Here Comes the Sun. 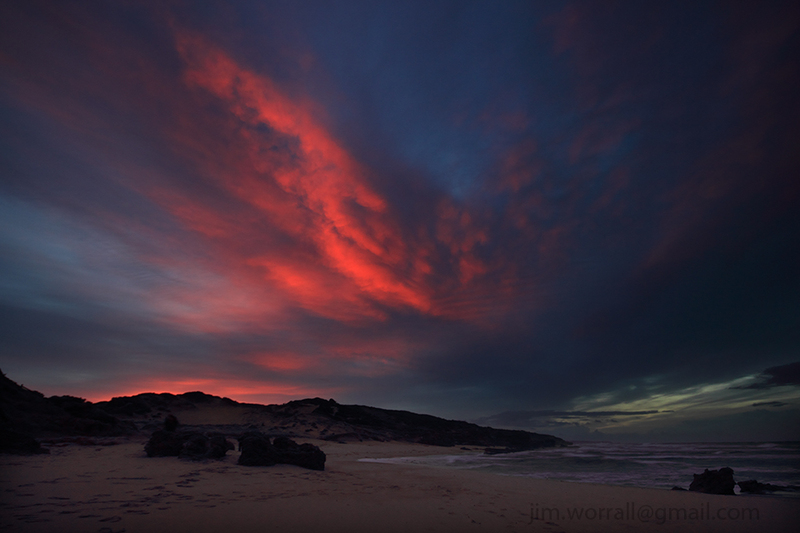 Clouds ignite briefly just before the sun rises above the horizon at Montforts beach, Blairgowrie. Below – Up Before the Day. The togs position themselves in the cool pre-dawn light. Below – The Wetting of the Footsies. The togs scramble as they’re caught by an unexpected foot soaking. 🙂 All good fun. 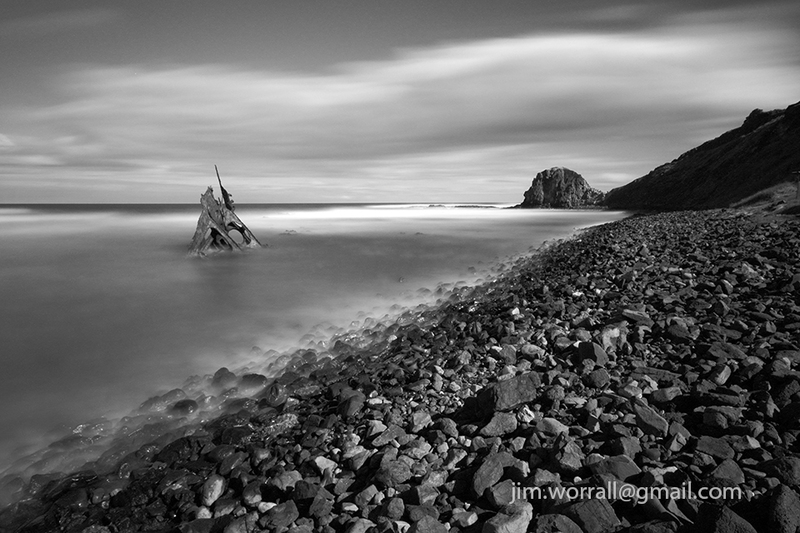 A 155 second exposure of the SS Speke shipwreck at Kitty Miller Bay on Phillip Island. 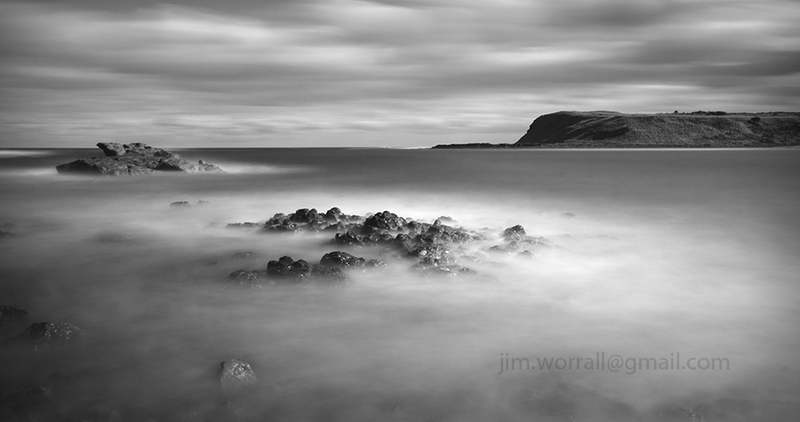 The image was taken during daylight using ND400 and ND8 filters stacked together to give about 12 stops of darkness. The image is available to purchase as a quality print at Redbubble. 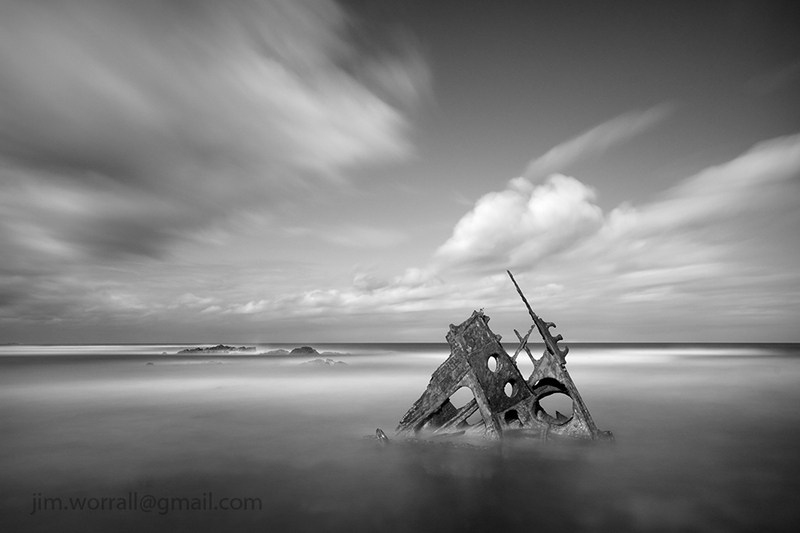 You can see more long exposure images of the SS Speke shipwreck here. A collection of images from Number Sixteen (16) beach at Rye, on Victoria’s Mornington Peninsula. Number 16 beach – Rye. Pictured below, a couple of images taken close to the action. 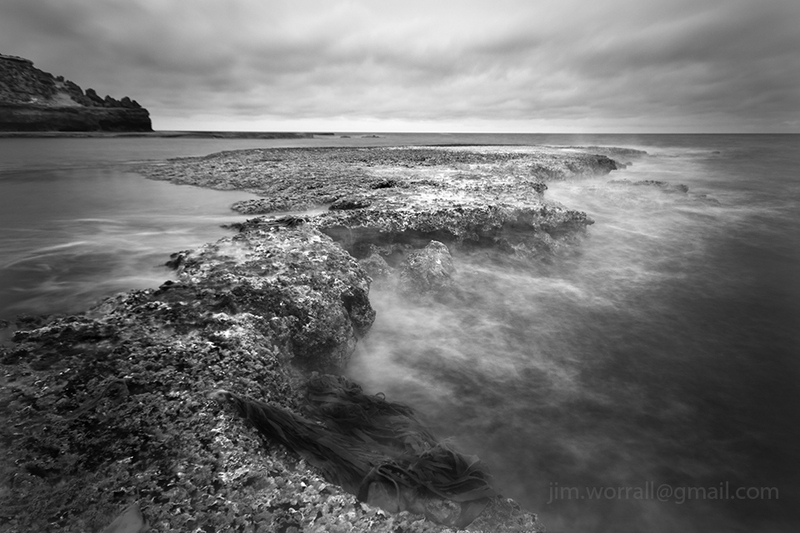 Some long exposure images from Cape Schanck on Victoria’s Mornington Peninsula. 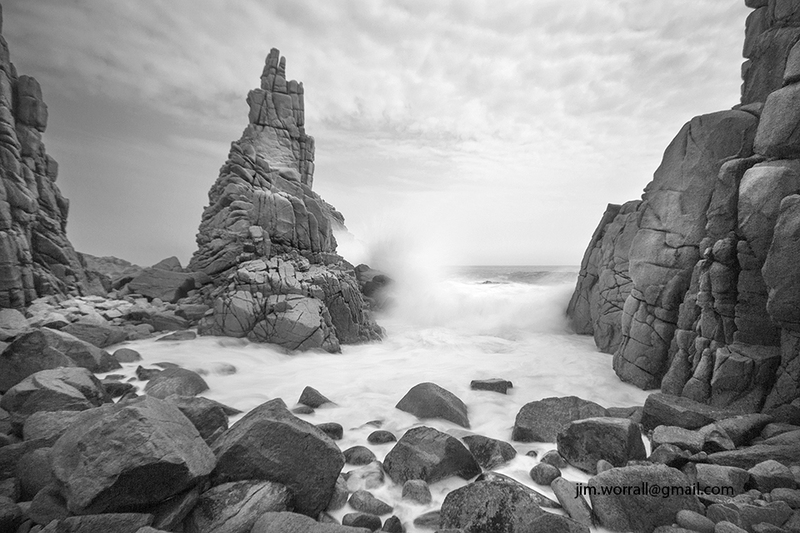 Pictured below, long exposure images of Bass Strait waves crashing onto the rugged coastline at Cape Woolamai on Phillip Island. 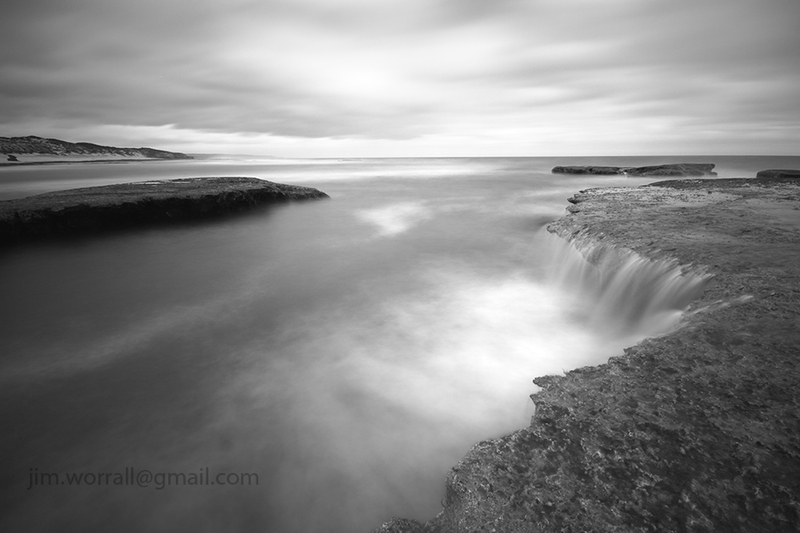 Below is a series of long exposure images taken during a photography group excursion to the Bay of Islands at Sorrento. Conditions were ideal for those of us wanting to take long exposures. Pictured below, some of the excursion group members setting up in anticipation of a colourful sunrise that never really eventuated. Following are a couple of long exposure images of the SS Speke shipwreck at Kitty Miller Bay on Phillip Island. The first image was captured using an ND400 and two ND8 filters stacked together to achieve an exposure time of 195 seconds on a bright afternoon. 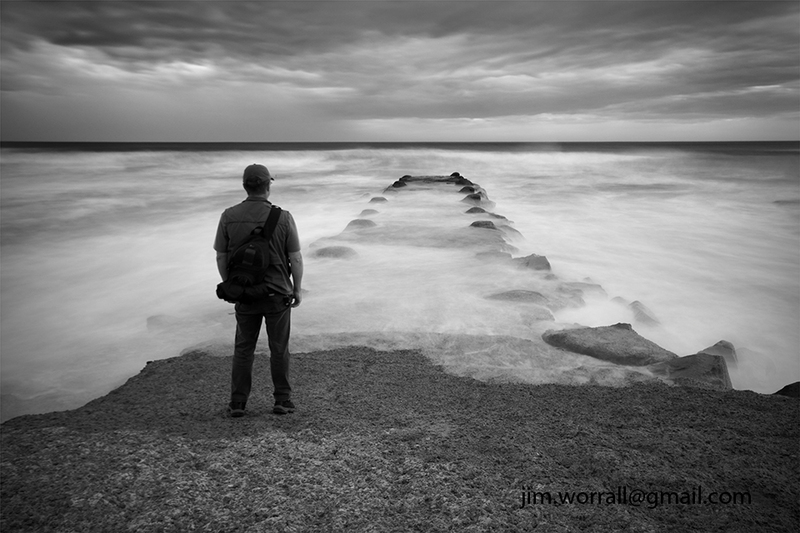 Such a long exposure allows blurring of both the ocean waves and the moving clouds. The image below is a 13 second exposure. 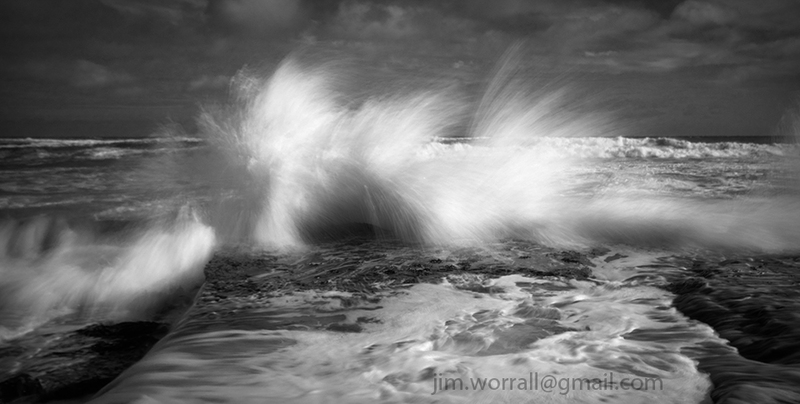 This shorter exposure allows misting of the waves but leaves the moving clouds only slightly blurred. 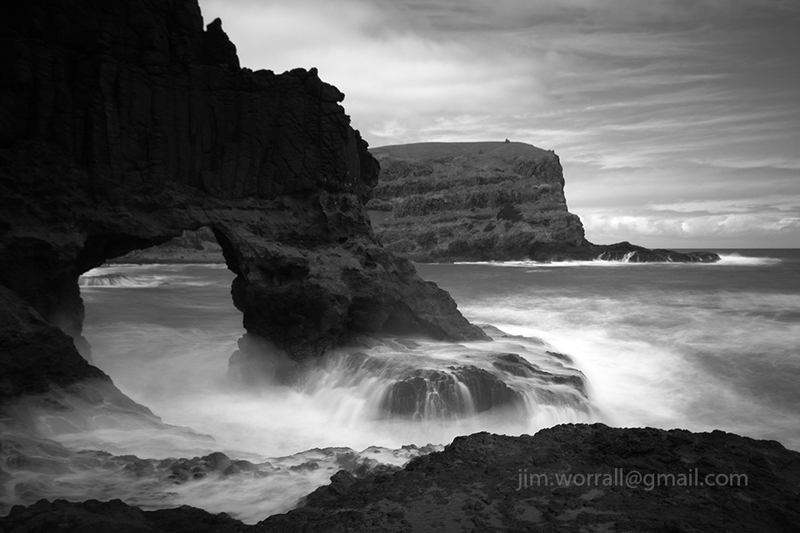 Pictured below, a 10 second exposure of surf washing over the dark rocks at Kitty Miller Bay. Below, a 2.5 second exposure of waves crashing onto the beach at Kitty Miller Bay. 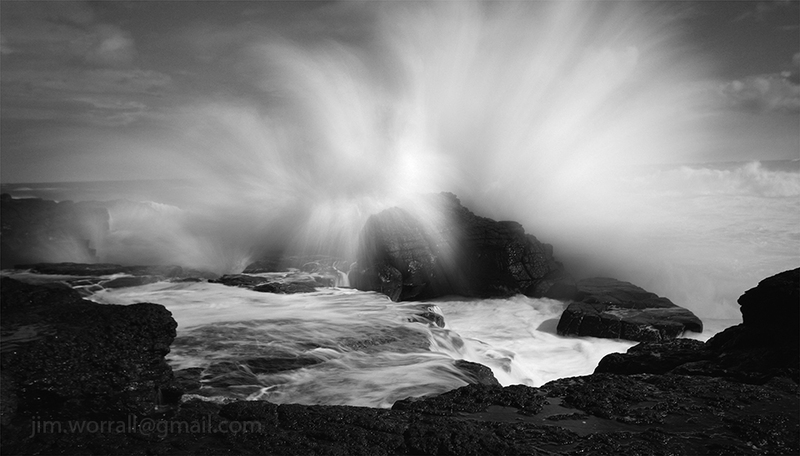 Finally, a 0.8 second exposure of a large wave slamming into a rock on Kitty Miller beach. 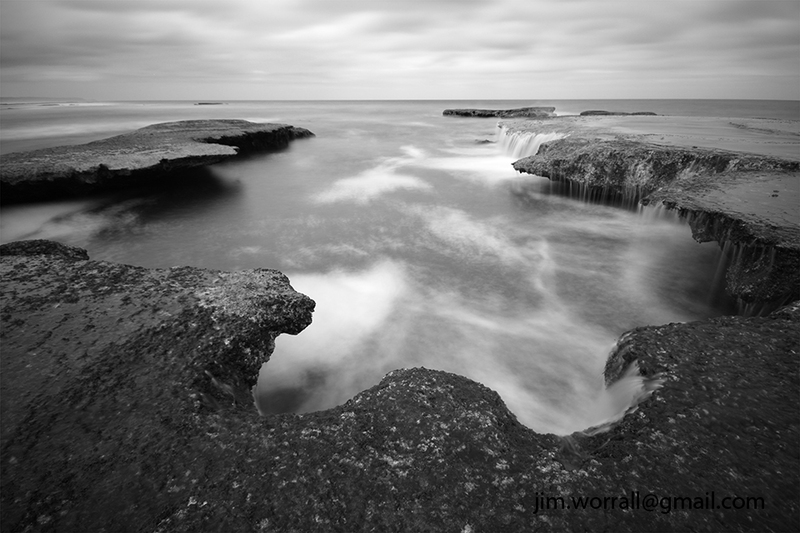 If you’re new to long exposure photography using dark ND filters then you might like to check out this page for some tips to get you started. 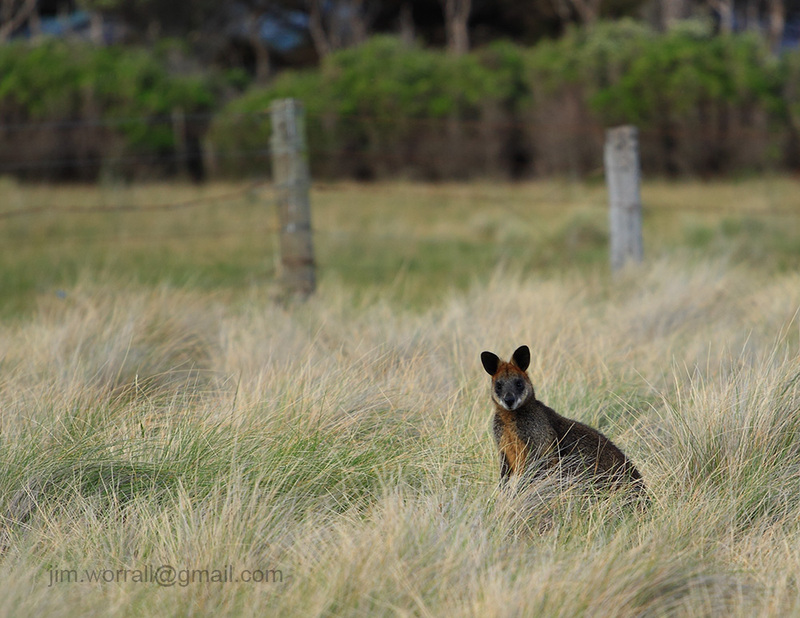 Following are some images from the beach at the end of St Pauls Rd, Sorrento on the Mornington Peninsula. The image above is available to purchase as a print in various forms here and here. The arch image above is available to buy as a print here and here. 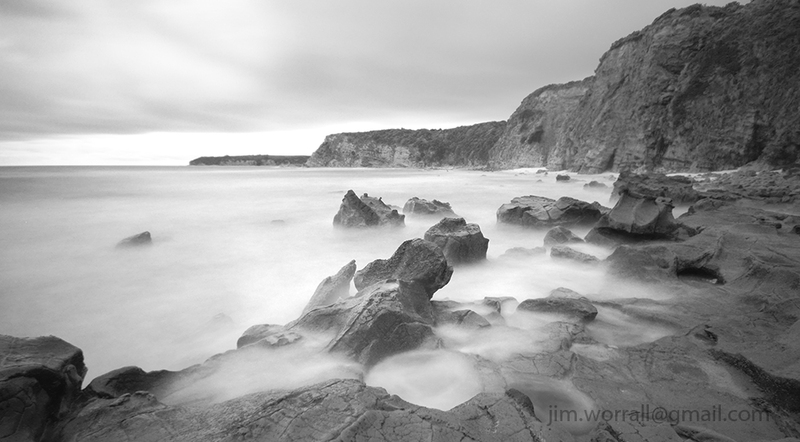 Following are some long exposure images from Bushrangers Bay on the Mornington Peninsula. The bay is accessible via a scenic walking track that begins at the Cape Schanck lighthouse carpark. Allow about an hour each way for the walk and make sure you carry some drinking water. There’s also an alternate walking track that goes from Boneo Road to Bushrangers Bay. Both tracks are about the same length. The image above is available to buy as a print at my Zazzle and Redbubble sites. The image above is available to buy as a print here and here. The image above is available as a print at Redbubble. 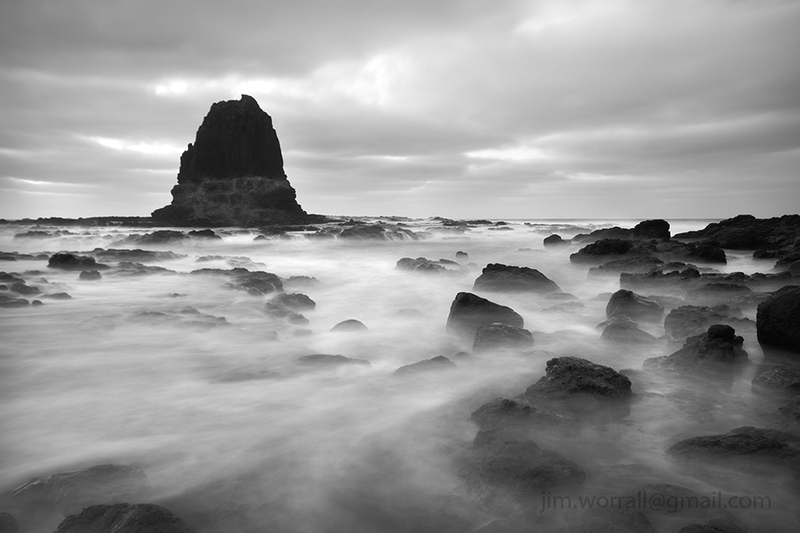 Images from the beautiful Pyramid Rock on the rugged south coast of Phillip Island, Australia. You can reach the Pyramid Rock car park by driving to the southern end of Pyramid Rock Road which is located just west of the Grand Prix racing circuit. 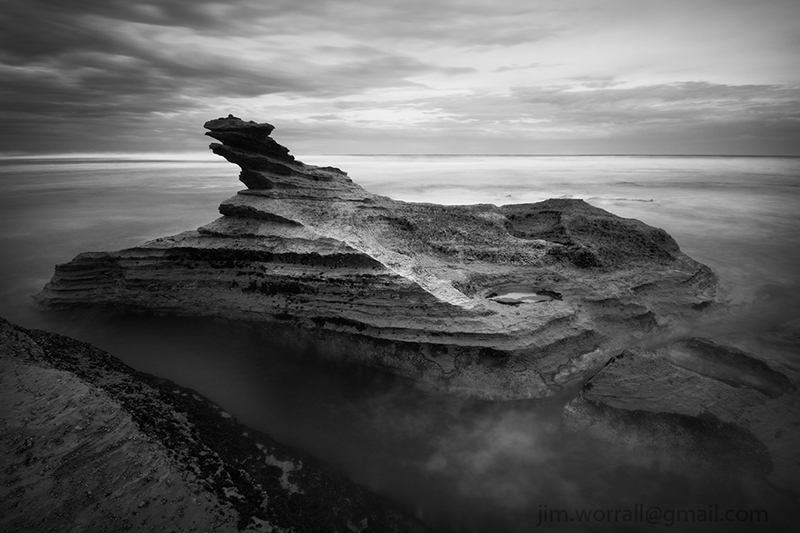 Below – A long exposure image of Pyramid Rock. This image is available to buy as a quality print at Zazzle or Redbubble. 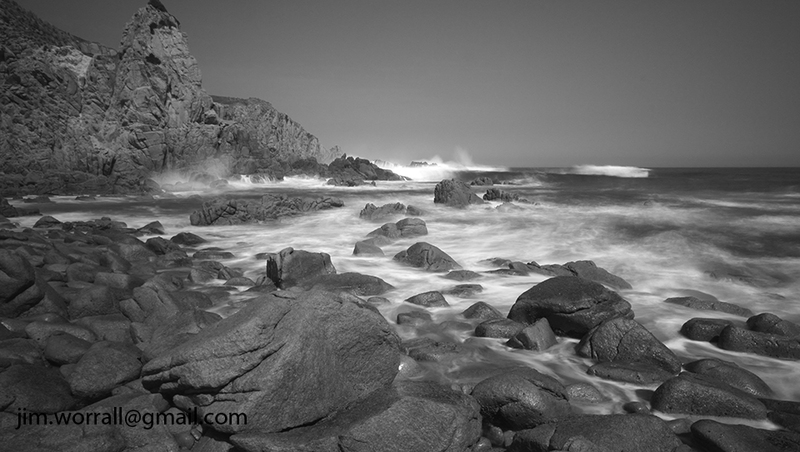 A long exposure image of waves crashing on the the dark basalt rocks on the beach near Pyramid Rock. This image is available to buy as a quality print at Zazzle or Redbubble. Below – This is my friend “Wally”. He was following me around the cliff tops at the beach. He was curious yet still cautious enough to keep a safe distance between us.